As of now, the U.S.-China trade dispute is "on hold," U.S. Treasury Secretary Steven Mnuchin said yesterday (May 20). Wall Street didn't ask any questions of Mnuchin's declaration; the Dow surged 300 points at the opening bell this morning. Why is the U.S.-China trade war suddenly "on hold"? We suspect a rapid shift in trade policy means the United States has an ulterior movie – one that could drastically affect your finances if you're caught unprepared. We took it upon ourselves to find out that motive this morning… and we got our answer from U.S. President Donald Trump himself. It's the kind of answer Uncle Sam doesn't want the public to know. But understanding it could be the difference between losing a huge chunk of your net worth and boosting your returns by 25% or more. 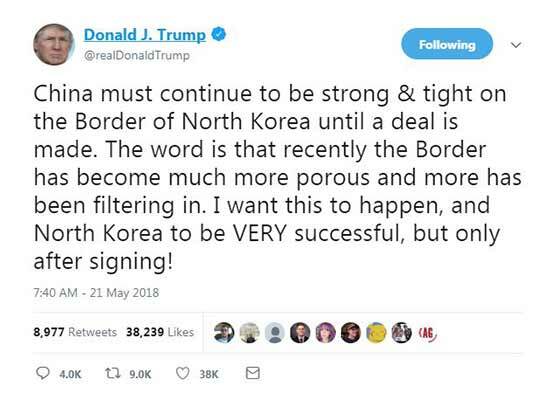 Following Mnuchin's statement yesterday, President Trump pushed via tweet this morning for China to continue "strong & tight" trade sanctions against Kim Jong Un's regime until a possible accord over the North's nuclear program is reached. That tweet told us everything we needed to know about the currently suspended U.S.-China trade war. You see, the White House needs the June 12 Trump-Un meeting in Singapore to be successful. A successful first summit would boost President Trump's repertoire with the global public immeasurably. Yet a productive first summit for the United States requires China's cooperation. Indeed, China holds massive sway over North Korea as its main source of income. In fact, it accounts for approximately 90% of trade with the Hermit Kingdom. So when Big Brother says "Jump," North Korea asks "How high?" Up until yesterday, the United States and China were embroiled in an increasingly bitter trade war. So far, the United States has slapped tariffs on Chinese steel and aluminum goods, and China has slapped levies in response on American planes, cars, and soybeans. That's when North Korean state news agency KCNA stated that the country will "reconsider" the historic June 12 meeting if the United States insists on Pyongyang relinquishing its nuclear weapons, The New York Times reported that day. This development, which smacked of classic North Korean rhetoric, caused Washington to stop in its tracks – shocked by this reversal of Pyongyang's recent peaceful tone. And once that initial shock settled, President Trump pointed to China as the true culprit behind North Korea's shift in stance. "If you remember two weeks ago, all of a sudden out of nowhere Kim Jong Un went to China to say hello again – second time – to President Xi," Trump told reporters on Friday (May 18), according to The South China Morning Post. The president was referring to a May 8 meeting between the leaders. "It could very well be that [Chinese President Xi Jinping] is influencing Kim Jong Un. We'll see what happens," Trump said. Now, three days later, the United States has backed down on its plan to impose sweeping tariffs on China. The reprieve came as many crucial details remain undecided. The New York Times was pessimistic, reporting yesterday that "trade experts warned that the suspension of tariffs could undercut [President] Trump's leverage and thrust the United States back into the kind of lengthy – and ultimately fruitless – negotiations with China that have bogged down previous administrations." …getting North Korea to the negotiating table. Will Pyongyang Agree to Truly Denuclearize? Disassembling Kim Jong Un's nuclear stockpile is the only viable option for true U.S.-North Korea peace. Kim Jong Un's concessions to anything less are nothing more than empty promises that we've seen many times before. Which means investors should hold onto their "weapons," too – those weapons being the defense plays we've long recommended. Even if North Korea does agree to denuclearize, the de-nuking process will need to be monitored and verified by U.S. military experts, which could take years. It has been decades since U.S. troops actually set foot onto North Korean soil, so the United States will need all means of defense on hand should a melee erupt when we're there. And if relations between the United States and North Korea devolve to where they were just six short months ago, then the United States will need the expertise of Boeing Co. (NYSE: BA) and Lockheed Martin Corp. (NYSE: LMT). Those companies are vital to maintaining our missile defense systems as well as upgrading our outdated Minuteman ICBMs cache. Given recent market volatility, it's all but impossible to predict exactly how the defense sector will react to the headline drama leading up to Trump and Kim's scheduled meeting in June. One of our favorite ways to prepare in a situation like this is Money Morning Defense and Tech Specialist Michael Robinson's unique variation of a "Cowboy Split." In this play, instead of investing all of your available capital in your favorite defense stocks (any of the great firms mentioned above are excellent bets), you split your investment into thirds. You could use one-third to buy at the current price, set a lowball limit order to buy a second tranche at a 10% discount, and a third tranche at a 20% discount. This automatically sets you up to buy more shares on significant dips and helps take the emotion out of trading during tense times. So ask yourself right now: Are you where you want to be financially?